Pool Court was one of those cases that come to us not through official notification but by word of mouth, when it was threatened with complete demolition. It’s a small 1970s house designed by Francis Pollen and located in the historic Thames-side village of Sonning – somewhere known more for the architecture of Lutyens than for its post-war houses. 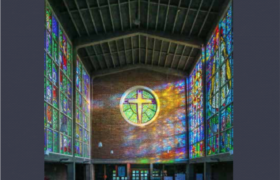 Educated at Cambridge and the Architectural Association, the architect Francis Pollen (1926-87) is best known for his church work, such as the Grade II Abbey Church of Our Lady, Help of Christians in Worth, Sussex, acknowledged as his masterpiece, and more locally for Pool Court, St John Bosco in Woodley, and St Peter, Marlow. He was also known for applying his contextual modernism to commercial and residential commissions. Having met Lutyens as a child and worked on the Lutyens Memorial volumes for Country Life, Francis Pollen was the ideal choice of architect to design a contextually appropriate house for Sonning, on the same road as Lutyens’s Grade I-listed masterpiece Deanery Garden of 1901. As Alan Powers notes in his monograph on Pollen, at Pool Court he deliberately employs a ‘Lutyens-like roof form, steep with sprocketed eaves and glazed tablets’ in deference to its context. This roof, the distinctive corner window detailing and the low single-storey plan emphasise the care that Pollen has taken to create a modern building which fully responds to its surroundings while using modern architectural language. The house is an important transitional form in the oeuvre of Pollen, as Powers notes, ‘where he pre-empted and resolved the fierce debate of “tradition” versus “modernism” that broke out around 1977’. Pool Court is located in Sonning Conservation Area and identified as a ‘positive building enhancing character’. Apart from the clear indication of its importance in the Conservation Area Appraisal, the house is listed in the entry for Sonning in Pevsner’s Berkshire volume, the first and most basic indicator of the significance of a building of this age. 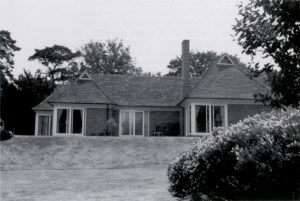 It is also included in the list of important architect-designed houses in the Society’s Journal No 4, Post-War Houses. Although the local authority were minded to refuse consent to demolish the house due to the adverse impact that its loss, and the larger replacement house, would have on the conservation area, the Society took the decision to submit a listing application to confer a higher level of protection on this heritage asset. Historic England considered Pool Court to be ‘an unusual hybrid of modern and traditional forms’ and acknowledged it to be ‘a singular design by a notable architect’, but said that it fell short of the high bar that 1970s houses have to reach to be listed. Following refusal of planning consent, the applicant appealed against the decision and we feared that this would be the end of the road for this little house, so we were very pleased when the appeal decision upheld the council’s refusal. 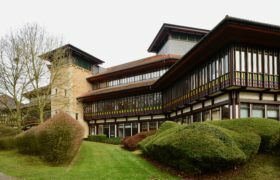 The Inspector cited the Society’s opinion in coming to his decision, quoting our view that the demolition of Pool Court would result in the loss of a distinctive building designed by an important nationally renowned architect. He commented that the house’s ‘simple plan-form, steeply-pitched hipped roofs and attractive full-length corner windows, together with a restrained use of materials, support the observations made by the Twentieth Century Society’. He concluded that the house should be considered as a non-designated heritage asset, the replacement of which would cause harm to the conservation area. As a result of this dismissal of the appeal, the house was sold by the applicants. The new owners have applied for a small contextual extension which respects Francis Pollen’s original architecture and retains Pool Court in its entirety, ensuring its long-term preservation.